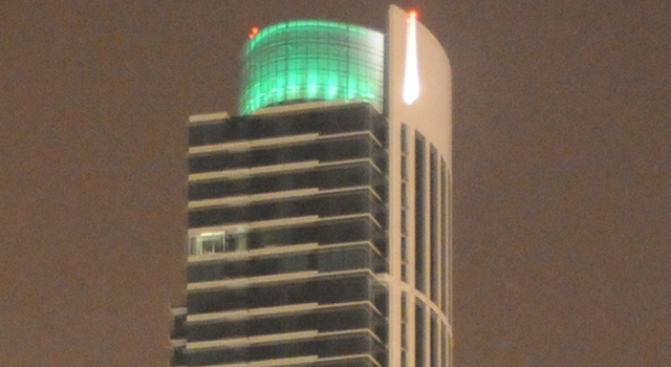 When the tower glows green, rain is foreseen. Maybe it should have seen its sister building not being built. CANCELED: Rincon Hill's 40-story luxury development at 45 Lansing. Whoa, that was dramatic. Let's do it again. Canceled! Well, not that no one saw this coming. Exhibit A: their expired entitlement. Exhibit B: the economy. You know how it is. Developer Turnberry's asking for a refund now on the $8.4 million they paid into the city's affordable housing fund, and seeing as how they're not actually building that $240 million tower, the city's obligated to fork up. As you were.